That sound. A wild-yet-synchronized cacophony of violins, cellos, double bass, clarinets, flutes, trumpets and harps sliding up to a sharp, down to a flat, up again a slice, down another, and then there it is: landing just so, placed on pitch, tuned and ready. Quiet. Poised. Deep breath, in and out. And Go. The concerto (from the latin concertare, which means to harmonize) can begin. Similarly at a band practice, or alone with your fiddle in the living room: before you play, you tune your instrument. You know what happens if you don’t. The ensuing tunes will sound either slightly off or quite terrible, possibly even make a piece of music unrecognizable. I know. We have a harp in our house, and if it ain’t tuned, it doesn’t do the harp-thing at all. When it comes to making music, this is all clear and accepted. It is the norm. We tune the instrument before we play it. If ever we drift out of tune we retune. Now how about the rest of our lives, all those instances when we ourselves are the instrument? Think of all the ways we relate to one another, the many ways we “make music” together (or not!) through our words, gestures, tone of voice, emotional quality, body posture: in conversations with our friends, our spouses and partners, in the interactions we share with our children, the myriad moments of engaging with one another on a daily basis. Do we come at these tuned? Or out of tune? As we all know, the results vary hugely, depending. When I tune my instrument – my self – I become present. I am both relaxed and attentive. My breath is calm. My emotions are regulated. I can make eye contact. I am at home within myself, and I listen and speak from this inner home. I don’t jump to conclusions. I remain curious, open-minded, soft-hearted. When I am out of tune, I tend to be tense, turbulent, quick to react, defensive or avoidant, irritable, impatient, caught up in emotional storms, and often covering vulnerability with a hardened shell. I’ve tested both versions many times – inadvertently and on purpose. The ensuing quality of connection is starkly different. Without fail, the former allows for greater intimacy, insight and connection. The latter tends to propel a relationship in a downward spiral, toward misunderstanding, hurt and separation. We are hardwired to react when feeling threatened. We can quickly move to defense, offense or shutdown when we don’t feel safe in a relationship, when we are not met with empathy, kindness, and patience. Staying tuned in the fray of relating takes practice, lots of it! I encourage my clients to practice tuning themselves for and in all their relationships, especially in their closest ones, with partner and kid(s). I explore with them how they can best regulate their emotions and get in touch with their inner home. Then I send them off with this homework: “When you’re ‘on’, engage. When you’re ‘off’, stop and recalibrate yourself. Make this a priority and see what happens.” The results are worth the while. My husband and I practice daily too, have been for years now – as said, it takes plenty of practice! We have agreed that whenever we get ‘out of tune’, we pause the conversation and do whatever it takes to get back in tune. This is our priority. It can lead to rather abrupt ends to conversations, but we have consistently found that those stubborn “We will talk this through no matter what marathons” really don’t lead anywhere useful and tend to leave us both depleted. Another place I get to practice daily is with my daughter. Just the other day, I was about to ask her for the fourth time if she could empty the dishwasher. I was getting aggravated and about to nag. On that day, in that moment, I caught myself just in time. I noticed where I was coming from, the irritated state I was in, and remembered my “being in tune before playing music” commitment. I took a deep breath. I let it go, refreshing my intention to communicate when “in tune”. By the time I was back in tune, the dishwasher was empty. What if we check in with ourselves before each and every conversation and notice whether we are out of tune or in tune? And what if, whenever we slide out of tune, we stop what we are doing and retune before continuing? It sounds so simple, yes? It is not necessarily easy; but it is a simple, straightforward, and extremely effective in navigating all our relationships with greater ease and grace. Tuning recalibrates us, allowing more consciousness to enter any relationship. 1) Awareness. This is where it all begins. How am I doing as I enter this interaction? Am I emotionally calm, clear-minded, open-hearted, centered, curious? Or am I out of tune? Am I either ‘sharp’ – tense, high-strung, wound up, tight, reactive, full of emotions that need empathy, release and regulation…? Or ‘flat’ – not fully here, not engaged, tired, not caring enough, feeling victimized, distracted, have I already given up…? 2) Commitment. Imagine a world in which we tune ourselves consistently before engaging with one another… as neighbor and friend, as partner, lover, parent, teacher, politician. Imagine a partnership in which you only ‘play music’ when you are both tuned. Imagine parenting with this awareness. The results are well worth the commitment. Commit to only communicating when “on” (grounded, open soft heart, centered). When you feel “off” (contracted, tense, shut down, defensive), pause and instead do a time-in (time to regulate until ready to communicate again). Whoever notices the “off-ness” calls a time-in. No discussion. Just time to regulate, recalibrate, each in one’s own way. It takes discipline to contain the momentum of reaction. 3) Regulate. As needed, regulate. Do whatever it takes to tune yourself-as-instrument. For each of us, this may look differently. Here are some ideas (find out what works best for you): Go outside; take a walk; drink water; breath; put your hand on your heart and remember you are loved; meditate; stretch your arms up and out and remind yourself that Life is not ‘out to get you’ (nor is your spouse or your kid, generally they are just working from the capacity they can access in any given moment); take a nap; dance; have a shower; cry and release any pent-up emotions until your heart is softened; talk with a friend, listen to music; and breath some more, focusing especially on your outbreath. More in-depth regulation involves tracking reactive patterns, noticing predictable triggers, doing shadow work, somatic trauma release, and making use of any other ways we change our state to gain insight and heal the un-integrated aspects of our self. Becoming whole is a journey. Working with a therapist or a mentor can be very helpful. You don’t have to do this alone. Then, when you try again, repeat and keep going for as long as you can, while remaining open-hearted and centered. As soon as you trip up and slide ”off”, repeat the regulation practices. And whenever possible, tune while interacting! This involves ongoing regulation, which hinges upon ongoing inner body scanning for sensations (tension registers there first). Pay attention, and you’ll notice a ‘storm’ brewing before it erupts. 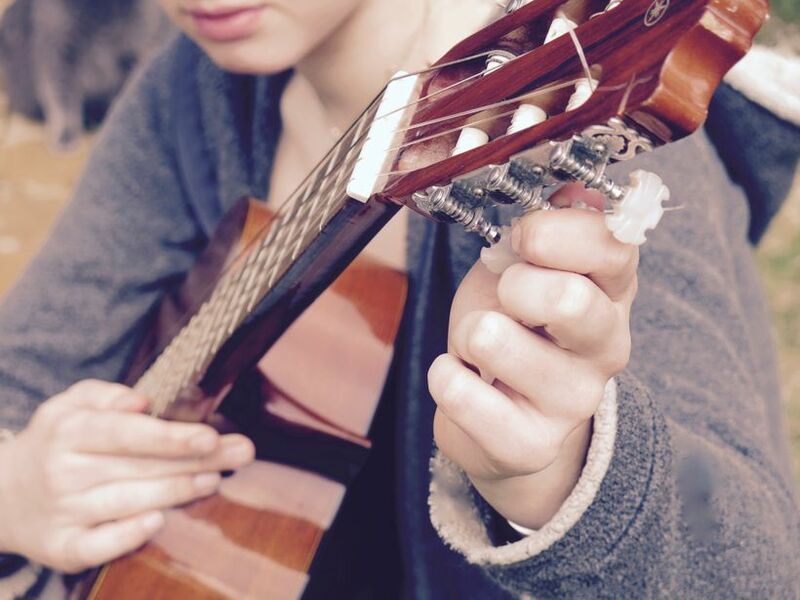 As soon as you notice early signs of arousal, you can regulate (deep relaxed breathing and soothing hand on heart) while continuing the conversation, becoming a virtuoso — a truly skilled ‘musician’. 5) Practice. Awareness is like a muscle. Regulating is a learned skill. They both take practice and witnessing presence. You will stumble. You will trip. But over time, one interaction after the other, gradually, you will build momentum for a safe, joyful, conscious container to relate, to communicate, to make ‘music’ together. Over time you will become adept at navigating through challenging patches and phrases in your conversations and interactions. This ongoing tuning is a core skill in approaching parenting as a spiritual practice. It is foundational for conscious partnering. To become aware of when we are off-key, to then bring ourselves into tune, and to play from there: that’s where the music happens. Then you have readied yourself for the duet, for the band practice, the symphony orchestra, the love-in-action. Then you are modeling for your child how s/he can calm down, communicate and learn to self-regulate. Then you are conversing with your partner in a shared container that allows for deeper understanding and insight, rather than throwing gas on a fire, speaking words you later regret, and going at it from an aroused system rather than a grounded, clear-minded one. So, next time you are about to chat with your partner, check in with yourself first: is my self-as-instrument tuned? If yes, go ahead. If not, go tune yourself. And if you slide out of tune during any interaction, pause and re-tune. As you get more adept, you will be able to tune and retune right in the midst of your interactions. And then, let the concerto begin. If you would like to join me and a wonderful, international group of parents as we explore these kinds of practices and how they can be applied to parenting, I invite you to “Parenting as a Spiritual Practice“ – an 8-week online course that runs May. 1 – June. 26, 2017.